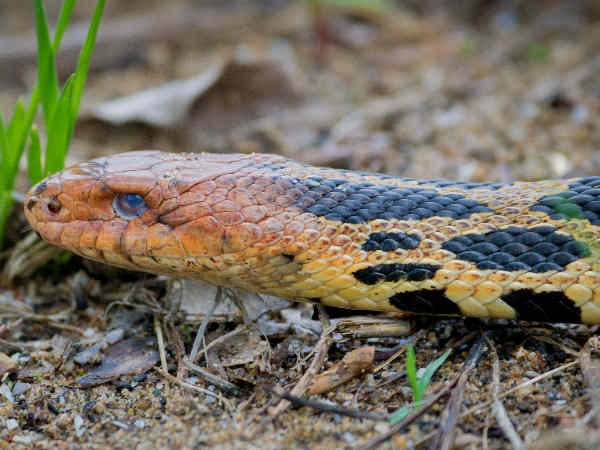 For a northern state, Wisconsin holds its own in terms of snake diversity. The twenty two Wisconsin snakes slither along the ground, climb trees and swim in the water. 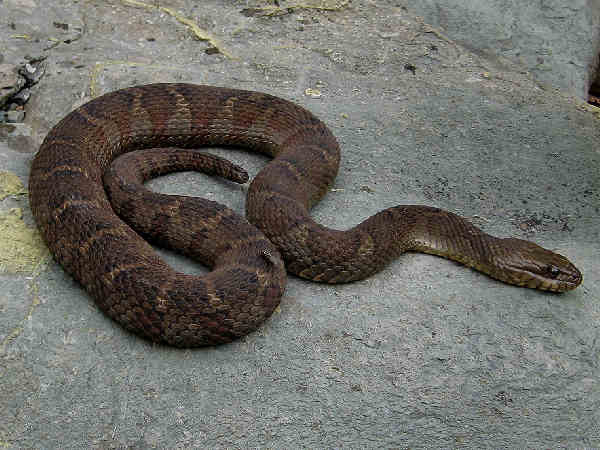 All but two species of venomous snakes, Eastern Massasauga (Sistrurus catenatus) and Timber Rattlesnake belong to the Colubrid family of typical snakes. Of Wisconsin’s 22 species, 14 are considered “rare” and listed as endangered, threatened or special concern. Both venomous snakes, the Eastern Massasauga (endangered) and Timber Rattlesnake (special concern) fit that description. Many of those snakes such as rat snakes, milk snakes and garter snakes have familiar sounding names for the general population. They are covered here with a few caveats. Space limitations mean that not all the snakes can be presented on a single page. Please press the Snakes button to get more snake pictures and help with basic Wisconsin snakes identification questions. Eastern Milk Snakes (Lampropeltis triangulum) are very adaptable snakes, inhabiting multiples areas of south Wisconsin from fields to forests to farms. Finding Milk Snakes in the east can be as easy as taking a hike and flipping over a few big rocks or logs. The can grow up to on average about three feet in length and the red to orange to dull rust color of the bands makes them easy to spot. Fortunately for Wisconsin hikers, the Northern Watersnake (Nerodia sipedon) is the state’s only Nerodia species. The body color changes from region to region. However, when spotting a long, bulky looking snake in or basking near the water, guessing it’s a watersnake will be a good first guess. Wisconsin’s Gray Rat Snakes represent about the northern most part of their range. Most of the population are southwest based and are listed as a species of concern. They grow to be very large, over six feet in length. The common name gray is really a very generic gray. They varies in color with some populations having light gray and others having dark gray bodies. Their bodies also have a pattern. 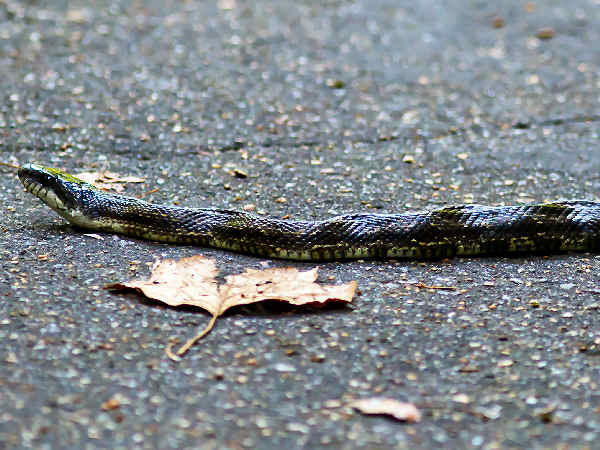 Interesting enough Fox Snakes might be the most common snakes found in Wisconsin homes. They range across the state. Their pale or light color body covered with bold dark patches means it might be mistaken for a copperhead. Note, there are no Copperhead snakes in Wisconsin, so there is little reason to be concerned about seeing this snake in the house or yard. The common name Fox refers to their odor. Behaviorally it tends to vibrate its tail when it senses danger. In areas where their tails come up against brush, it could sound like a rattlesnake. 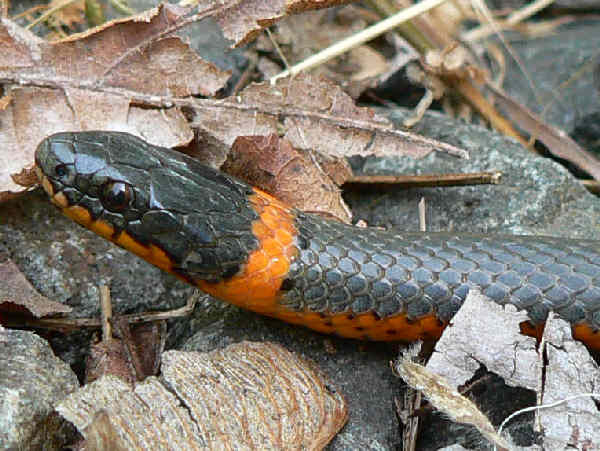 Wisconsin also hosts the Ring-necked Snake (Diadophis punctatus). It’s also the only member of the genus and adapted to habitat around residential areas. 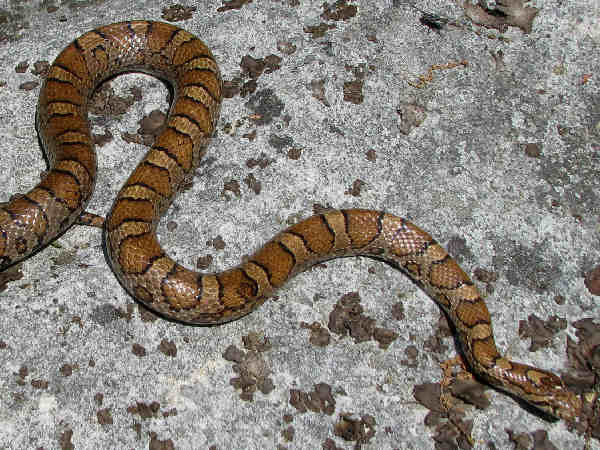 The picture highlights the snake’s characteristic light ring around the neck on an otherwise dark top of the body. Be warned. These snakes are mostly harmless but they do secrete a foul smelling chemical. when touched. Gopher Snakes (Pituophis melanoleucus) also go by the name bullsnakes. They are more common in the West than in Wisconsin. 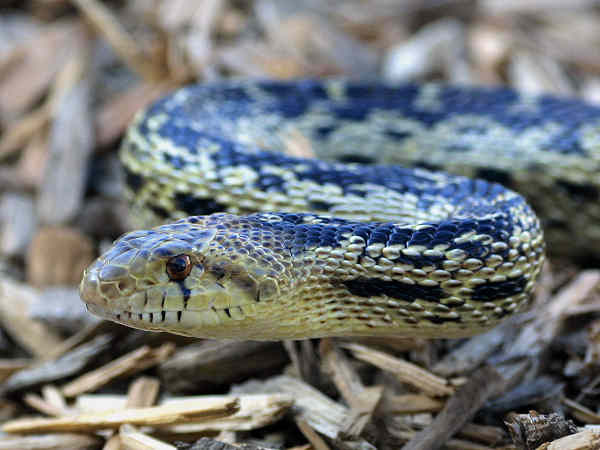 Of the remaining Wisconsin snakes, five belong to the Garter Snake Family. With the exception of the Common Garter Snake (Thamnophis sirtalis), the other species are listed as endangered or species of concern. They all have very limited populations, mostly in the south area of the state.